Custom made magnetic pop up sign system frame for portable trade show pop up system display kits and event exhibiting at conference events and seminars. Fast next day 24 hour delivery on exhibition pop up stands and promotional advertising pop up backdrop kits. 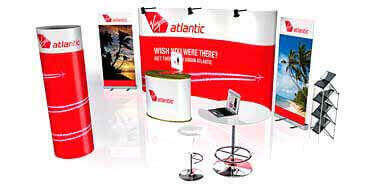 Lightweight curved, straight and corner portable pop up banner screens for trade fair promotions. Print design service available for cost effective pop up graphics UK. We supply design and printing for magnetic pop up display kits at events, trade shows, and conferences in the London. UK marketing pop-up stand company offering creative solutions for marketing presentations and corporate solution packages. We offer a comprehensive custom backdrop service for portable lightweight fabric popup stands available in straight or curved. We also supply unique promotional displays that can be designed and manufactured to fit your individual exhibition stand space. These include corner shaped stands and elaborate, custom built booth to suit your individual requirements. Pop up exhibition stands are the most popular type of systems at exhibitions in London, because of their portability and ease of use. They are also extremely economical as they can be used time and time again. The graphics can also be reprinted with a different graphics for various events. Whatever your requirement pop up stand banner the right pop out for any conference or seminar that you attend or are organising. If you are a marketing agency you can rest assure that you are in good hands and we can make your trade fair display with complete confidence no matter what your requirements are even bespoke marketing package sizes. Pop up stand banner builds all your stands to suit your business needs from small companies to large corporate concerns we can deliver your stand anywhere and all deliver to any exhibition venue in the UK, giving you piece of mind. Based in London allows you to visit our extensive showroom with every kind of portable backdrop display for every eventuality. why not Pop in . Stand banner can make your display for any situation and to almost any height or width to suit your requirements. UK trade show stand company produce custom sizes and unique items that let you stand out from the crowd. These products are more expensive than standard size solutions, but they are extremely economical when you consider you can take them to a variety of different shows and reuse them without any additional cost to you. 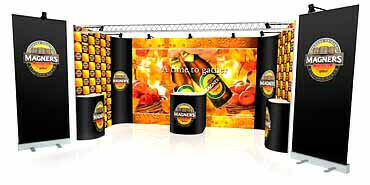 We sell promotional trade show backdrops that can be stored easily, then erected again when needed. Our pop out systems are built from high quality, lightweight aluminium and come with a ten year manufacturers guarantee. 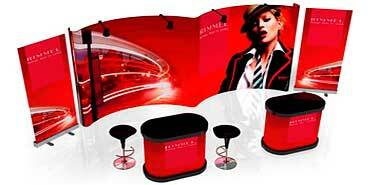 Portable pop-up kits are an ideal item for most indoor exhibition environments. They come in a range of sizes including 3x1, 3x2, 3x6, 3x4, 3x5, and 3x3 pop up stands and even 3x6, 3x7, 3x8 and more. 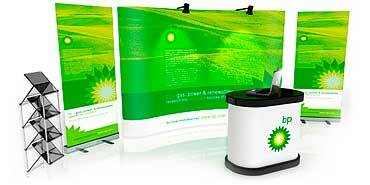 We also offer a custom pop up exhibition stands to suit your marketing booth. Our company can produce seamless backdrop screens up to any length and even corner stands that can be configured time and time again to fit different size shell scheme booth screens. Convenient portable marketing backdrops for every eventuality that can be purpose built for every and all marketing and advertising requirements. 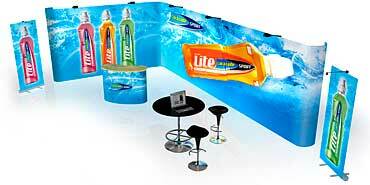 Exhibition pop up displays are a convenient and simple way to present your companies message or product. They can be printed with multiple sets of graphics allowing a completely versatile display for multiple solutions. Stand banner provides extras that can help help your marketing presentation with optional integral LCD TV mounts, Literature stands and lighting. With our systems being so versatile and simple to erect they are often used in shopping centres and similar situations to promote new products and services (B1 fire certificate). All stands are available with a selection of portable wheeled cases, designed for convenient ease of use and portability. London is a cosmopolitan city with a thriving business and is host to some of the best exhibition centres in the world. Many companies choose to exhibit in Manchester and Birmingham and come from all over the world to exhibit. Pop up banner stands are here to help make that experience as simple as possible and deliver the best results and options for all your trade show pop up displays deals. Apart from exhibiting you might require stands or advertising signs and banners for promoting your company at hotels and conformances and even airport promotions. Whatever your requirements we are here to help you. Do not forget we also provide cost effective, professional exhibition stand design and pop up stand printing. All our graphics are printed using HP Latex inks for new and replacment pop up graphic panels. Regardless of makes and models we can print new pop up screens to suit your exhisting frame, from all leading manufacturers. Simply give stand banner your problem and we can solve your exhibiting problem. Regardless of the frame style you need, we can fix it or manufacture it, makes no difference, from combined frame styles that go from straight to curved and even convex. The more interesting or different your magnetic frame is the more business it will generate, as customers and general public are drawn visually to frames that are different, be it wider or taller with unusual shapes, all this combined with professional printed graphics makes your popup sign stand out from the crowd. 100% guaranteed, or your money back*. 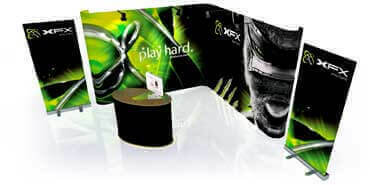 Common configeration for pop up systems are corner booth or L shaped frame systems, typically used on the end of a trade show isle and is a nacessity for exhitors who have a a right angle display that needs a backdrop banner pop up eall for only two sides. We supply a bespoke system with customised sizes to fit any shell scheme stand regardless of width or height. Stand banner can offer CAD drawings in plan view to demonstrate your floor space and ensure the system fits. We can custom build magnetic frames to different heights and can even build integral TV monitors into your corner booth for added "WOW" factor. Popup exhibition stands are available with international delivery and on many other products. We pride ourselves on being the UK number one custom exhibition printing company and promise to delivery your system with guaranteed next day delivery, even collect from our London office, when your stand is complete. For easy and safe transactions online, we now except PayPal as a convenient way for international business to buy stands in the United Kingdom for and situation. We also have 30 day trade accounts. Please note all trade accounts are required to pay for they are first order there after a trade account can be established. Fast UK delivery for all your portable marketing needs from banners to pop-up screens we can delivery next day to the UK and Europe. Simple cost effective solution for design and print with easy payment methods including PayPal and Trade Account.